Mondi is well known for its industrial bags. But it is less known that Mondi’s expertise in filling powdery goods does not stop at the bag. 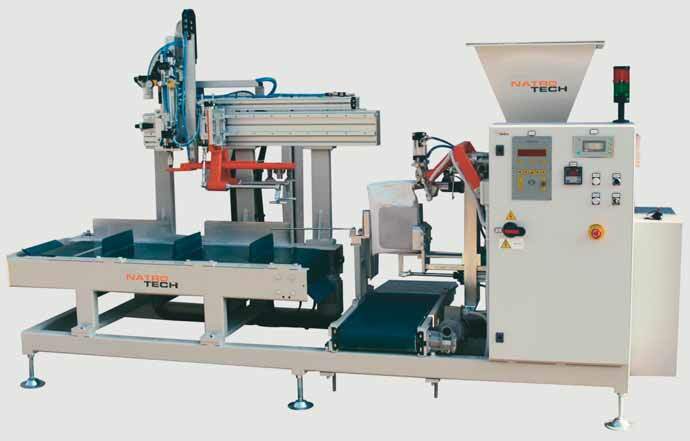 With its filling equipment producer Natro Tech, Mondi has bag filling experts among its ranks. Founded in 1925, Natro Tech’s filling expertise of nearly 90 years and the intense collaboration with customers in the building materials industry throughout the world represent a unique asset. Fully integrated into the Mondi Industrial Bags business segment, the company designs and builds filling equipment for industrial bags — mainly valve bags but also open mouth and FIBCs (flexible intermediate bulk containers). With the development of innovative machinery Natro Tech has built up a solid reputation as a state-of-the-art filling equipment producer on an international level. The company has developed specialized expertise in the building materials industry notably for dry mortar filling equipment and related service. Natro Tech’s portfolio encompasses a large range of filling equipment, most notably air packers and impeller packers, as well as related machinery such as bag applicators, sealing systems, weighing systems and palletizers. Natro Tech’s impeller packer 70BE/SI has a capacity of 400 bags per hour (25kg cement bags) and is suitable for a range of different filling products with a bulk density from 0.1 to 1.6g/cm3. Natro Tech provides a thorough knowledge of customers’ filling processes of powdery goods. This knowledge in combination with first-class materials and technologies as well as highly educated and committed staff enable the team to design filling solutions most suitable for fillers throughout the world. The on-site experience with air packers or impeller packers enables Natro Tech to give valuable input on optimized bag constructions notably to maximize filling speed. “We like to summarize the fruitful duality between the two Mondi entities as: filling equipment produced by bags experts and bags produced by filling equipment experts. This knowledge sharing allows us to offer high-performance yet cost efficient industrial bag solutions optimized to the customer’s filling processes,” states Thomas Ott, COO of Mondi Industrial Bags. The fully equipped Easy Pack was especially developed by Mondi’s filling equipment producer Natro Tech. For flexible usage at variable sites with relatively small filling needs, Easy Pack is well suited for filling 5 to 15kg Mini Bags. With a filling capacity of 200 bags per hour and an installation time of only one working day, the unit can easily be transferred from one site to another and is ideal for flexible filling needs. The light weight, small dimensions and fast installation time of Easy Pack allow fillers to fill bags at several sites within a short period of time without having to invest in filling equipment at each filling site. Easy Pack is ideally suited for small filling needs and impresses with its fast installation time and efficient filling capacity. Mondi Industrial Bags, a Business Unit of the Europe & International Division, is a major international producer of industrial paper bags, selling around 4 billion bags per year. Thanks to its broad range of bag specifications, Mondi Industrial Bags serves major industries including cement and building materials, chemicals, food, feed and seed. The Business Unit operates a dense sales and service network as well as its Bag Application Centre, where researchers develop and test innovative packaging solutions.